begins with CPT® 2018 Professional Edition. Center) payment and status indicators..
CD-10-CM 2018- The Complete Official Codebook provides the entire updated code set for diagnostic coding, organized to make the challenge of accurate coding easier. This codebook is the cornerstone for establishing medical necessity, determining coverage and ensuring appropriate reimbursement. 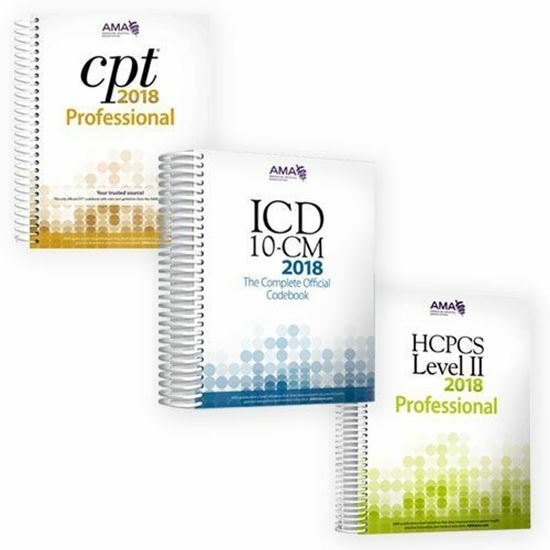 This 2018 edition includes visual alerts, including color-coding and symbols that identify coding notes and instructions, additional character requirements, Medicare Code Edits (MCEs), manifestation codes, other specified codes, and unspecified codes, coding guideline explanations and examples. Illustrations and definitions in the tabular section is the highlight key components of the disease process or injury. There is also a Neoplasm Table aids in the accurate coding of neoplasms by anatomical site and nature or the neoplasm along with Supplementary appendixes that offer more detail on the 10 steps to correct coding, three-character codes and Z codes.